We have a Class C motorhome. We have used it quite often this winter and have resisted winterizing it because we use the shower and toilet and such. I have heated it through the winter so far without any problems, but during a recent cold snap the bathroom plumbing froze. I believe the problem is where the water lines run under the floor to the opposite side of the cabin. Interior heat, I suspect, was not enough to keep the lines from freezing under the floor. To thaw the lines, I am using a bullet heater under the motor home outside to try and get the floor temperature above 32 degrees. In the living area I have added a ceramic heater and fan and have opened all the drawers to get heat back into the recesses of the bathroom. So far I have been able to unfreeze the hot water line, but not the cold water line yet. What can I do to keep this from happening again? I cannot find any diagrams telling me exactly where the water lines run under the coach. Is my only solution to winterize those lines? 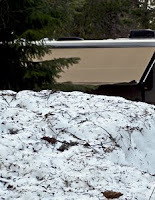 David, winter RVing is indeed enjoyable - especially if the family is into the snow toys and/or slope activities. But, as you say, it can be difficult if the plumbing succumbs to below freezing temps. I would be surprised if the water lines truly are routed via the exterior under the coach. Typically they will route in and through cabinets or in voids through the walls and maybe under the top flooring. Some coaches, however, are better insulated than others, so it could be an insulation issue. If you can trace the lines, it may be possible to wrap them each in foam-type insulated jacket available at most home supply centers. There is also heat tape that can be wrapped around them in those areas prone to freezing. Accessibility is the key however. If you didn't need water for the shower, another option would be to blow the fresh water lines clear of all moisture and simply use bottled water for flushing the toilet. Also remember, running water is less likely to freeze. 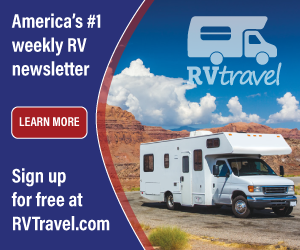 If possible, when you are connected to a dump assembly in a campground for instance, leave the gray tank valve open and the cold water seeping just a little through the bathroom faucet. The gray water will continually drain and this will minimize the chances of the cold line freezing. All this advice from a guy who spent all but the last few years living in FL and SoCal! But it may help. Other than that, winterization is the only other viable option when the coach is not in use.